In one of his few (and last) TV appearances, The Peanuts creator Charles M. Schultz said through tears on the Today Show of his most famous creation Charlie Brown: “That poor kid. He never even got to kick the football. What a dirty trick.” This is much how Schultz saw life in general – one big dirty trick. Since its first comic strip creation in 1950, The Peanuts has always stood out as much more than just a cartoon. It has always been, and was always meant to be, a statement about life, society, friendship, adulthood, and being a kid and thinking kid thoughts. The cartoons are written completely from a child’s perspective, right down to the side angles on the school desks, to the way that Snoopy’s face can be seen both from the side and front. Adults are an after-thought in Schultz’s world. We never physically see anyone’s parents, and the teachers only appear as voices, and their voices are nonsense sounds coming through loudspeakers to the tune of: “Waaa. Waaa waaaa waaa waaah.” Schultz doesn’t even give them real words to say, because his cartoons were never about parents or teachers or anything other than what it’s like to be a kid (and a dog) in a kid’s world. 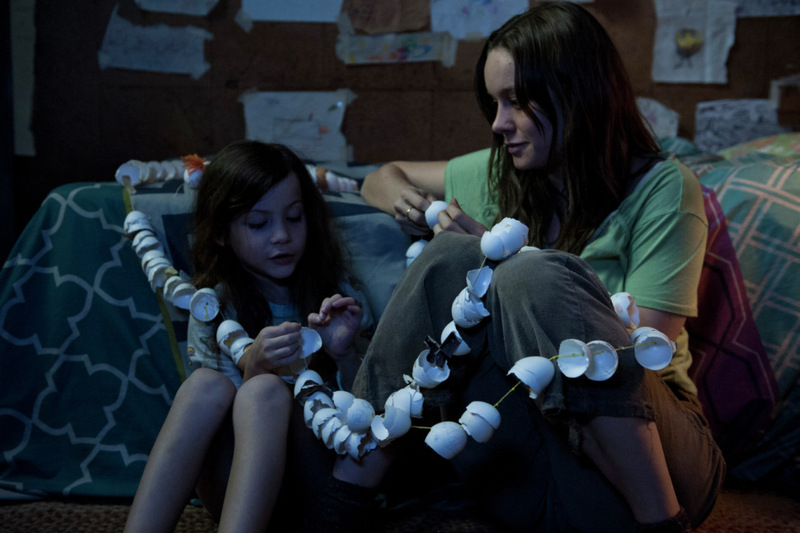 The themes are often very adult, but come from the heart of children. The cartoon somehow manages to cover baseball, sibling rivalry, addictions (Linus and his blankey), heartbreak and depression, politics, art, (Schroeder’s piano obsession is a metaphor to how Schultz himself was with his art and drawings) the meaning of life, insecurities, anxiety, and even death – all through the eyes of a child. Well, many children. Charlie Brown and the gang. 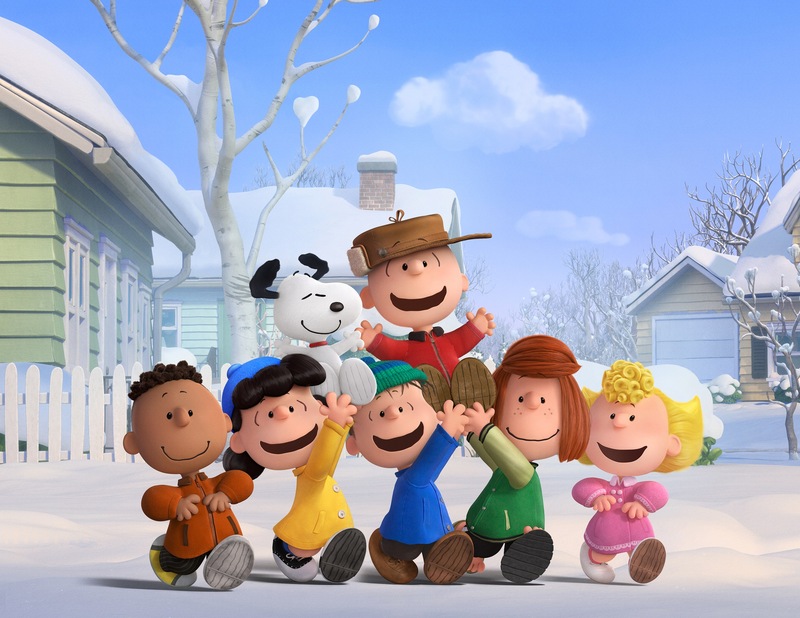 The Peanuts Movie does its best to keep the tone of the original, while remaining both a relevant and fun adventure for both kids and adults. I went and saw it on its opening day, November 6th. That day also happens to be my husband’s birthday. My husband, who died suddenly at age 46 from a massive heart-attack in 2011. Since he and I were both mutually obsessed with all things Charlie Brown, and since the film came out on his birthday, I took it as a sign that he wanted me to see it. I’m so happy that I did. Then we get to the real meat of this story. There is a new kid in town, and the moving truck pulls up right next to Charlie Brown’s house, as he hides in the nearest bush to see who is moving right next door. He is instantly excited about the possibilities of someone new being in the neighborhood, someone who doesn’t know him or know how many times he has screwed up or considered himself a loser. He is excited about starting over and new beginnings. So excited, that he leans too far forward on the neighbors fence and the whole thing falls down like dominoes. Everybody runs and scatters, and Charlie fears he has already embarrassed himself, before she even meets him. She, being, of course, a cute little-red-haired girl, that Charlie immediately finds himself smitten with. Little hearts dance above his head after seeing her walking around in her yard or checking her mailbox, yet when he tries to knock on her door to introduce himself, he chickens out and runs away instead. The next day in school, when the new girls pencil rolls off of her desk and lands by his feet, Charlie Brown is so filled with panic at the thought of approaching her to give her pencil back, that he ends up in the nurses office. When the kid next to him asks him what he’s in for, he replies: “It seems I have a serious case of inadequacy.” Meanwhile, Snoopy is feeling left out of the school activities, and makes some hilarious attempts at getting into the school building. He is kicked out, literally, by Lucy, who yells: “No dogs allowed!” When Snoopy lands face-first in a dumpster, he pulls out an old typewriter, and , with Woodstock on his shoulder, he begins once again writing another chapter in his now infamous fantasy stories of the WWI Flying Ace and the Red Barron. This is what I love about The Peanuts. In this world that Schultz has created, even the dog needs an escape from reality. The dog has a fantasy life. As if that weren’t bad enough, the Winter Dance is even worse. After spotting the new girl dancing and smiling in her living room, Charlie realizes that he needs to learn to dance and enter the dance contest at the Winter Dance. 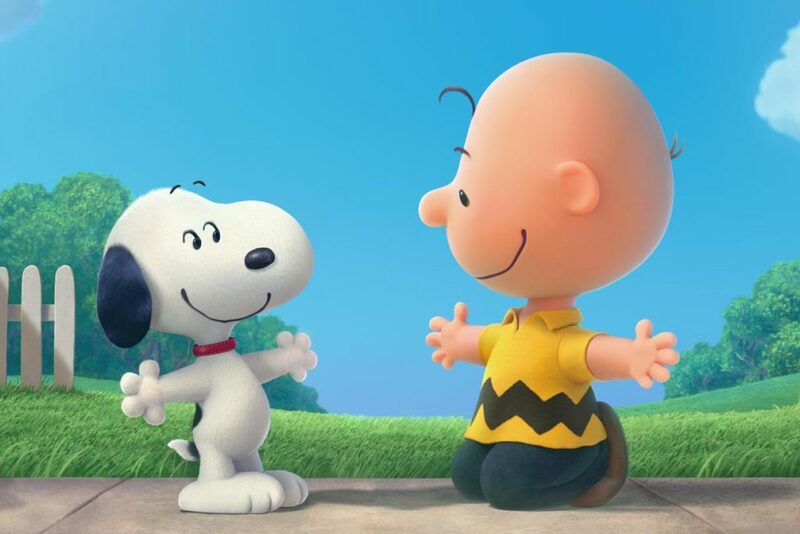 Once again, man’s best friend Snoopy comes through and teachers Charlie Brown how to dance. The time finally comes at the dance itself, and everything is going great. When its his turn to take the dance floor, Charlie Brown dances wonderfully and everyone starts applauding. Until he slips on a fruit punch puddle on the floor, and sets off another domino effect, that ends with the sprinklers turning on and thus ending the dance. At the end of the day, he goes home with his loyal dog. “Snoopy, what would I ever do without you?”, he asks. “You really are my best friend. It’s so nice to have someone to come home to who will just simply listen. Someone who will listen to what I have to say.” But it’s too late. Snoopy is fast asleep and snoring loudly. I don’t want to give away the entire plot of the movie, so what I have written above is just the first half or so. After that, Snoopy’s Flying Ace Adventures continue with a poodle named Fifi who he must save from harm’s way, and things start going suddenly right for Charlie Brown after he scores the first 100 percent ever on a Standardized Testing Exam. Overnight, he goes from the lovable loser to a winner who is being labeled a “genius”, and we start to see how this affects everyone else around him. Lucy is angry and jealous that he is getting so much attention. Sally is using his fame to start selling merchandise and making some money. All the while, Charlie feels like the exact same person he always was, and he wonders if all this attention is real. “Do they like me for who I am, or who they think I am?” There is a school assembly to celebrate his perfect score, and some truths come out during that assembly that I won’t give away here. The last few scenes in the movie focus on Charlie Brown attempting to reach the girl, before the girl pulls away on the bus for summer camp. He wants to finally say hello and give her back her pencil, and he wants to ask her WHY she chose to be his pen-pal partner, out of everyone in the whole class. Meanwhile, Snoopy is off trying to save his poodle in distress, and facing many hurdles along the way. Will Charlie Brown get to speak to the girl he is in love with? Will his trusty kite help him to get to her? What will she finally say to him if he does make it in time? Will Snoopy save his love? Will Pig Pen ever shower? Will Charlie Brown finally get his kite in the air? Will he finally get to kick that football? Will he finally get the girl? The answer is YES , to at least one of these last three questions. To find out which one, you’ll just have to see the movie. And make sure you stay during the credits. One of the questions is not answered until that time. And all the other questions about life, love, and childhood, will continue to be explored by The Peanuts, and by the always hopeful, always lovable, good ‘ole Charlie Brown. I can’t wait. Next “Dancing With the Stars” Review: Why is Mark Randomly British, and Can I Be On The Show Now, Tom? 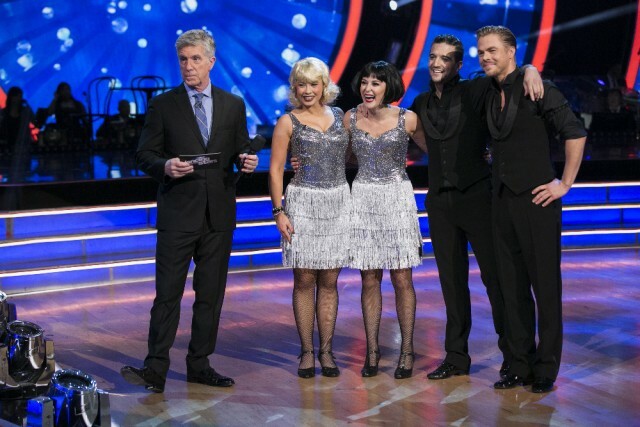 “Dancing With the Stars” Review: Why is Mark Randomly British, and Can I Be On The Show Now, Tom?